The Kia Tigers' 2017 Korea Baseball Organization championship was fueled in part by a combination of aggressive free agent signings and smart trades. 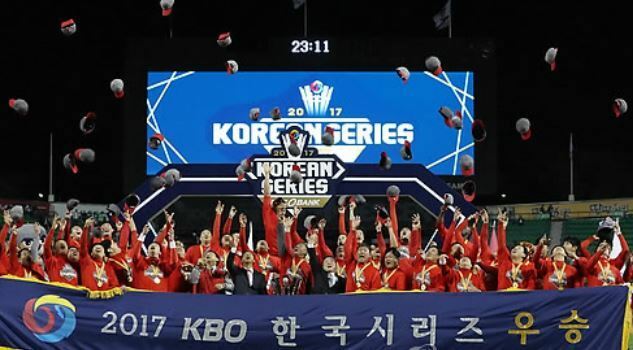 They ended their eight-year championship drought on Monday by defeating the Doosan Bears 7-6 in Game 5 of the Korean Series at Jamsil Stadium in Seoul. They finished first in the regular season with a record of 87-56-1 (wins-losses-ties), and advanced directly to the Korean Series. Following a three-week layoff, they lost the series opener last Wednesday before winning four straight to clinch their first title since 2009 and 11th overall. Throughout the year, they were driven by new faces across the field. The front office opened up the wallet last winter to retain right-hander Hector Noesi for a second year at $1.7 million and to sign slugging free agent outfielder Choi Hyoung-woo to a four-year, 10 billion won ($8.9 million) contract. Noesi, who led the team with 15 wins and 206 2/3 innings last year, topped himself with 20 wins while leading the KBO with 201 2/3 innings. He was the winning pitcher in the deciding Game 5 on Monday. Choi, who finished runner-up in last year's MVP voting, was once again among the league's premier sluggers. He batted .342 with 26 homers and 120 RBIs, the second-highest total in the KBO. He also drew a league-high 96 walks. Choi didn't slug any home runs in the Korean Series, but still picked up a few timely hits to keep rallies going throughout the series. The Tigers also parted ways with first baseman Brett Pill and replaced him with Roger Bernadina, who responded with 27 home runs, 111 RBIs, 30 steals and a .319/.370/.542 line. He led the Tigers with a .526 average (10-for-19) and seven RBIs. The Tigers kept free agent pitcher Yang Hyeon-jong to a one-year deal worth 2.25 billion won, and the left-hander enjoyed the best season of his career in 2017 by winning 20 games and pitching a complete game shutout in Game 2 of the Korean Series. Getting the Korean Series MVP honors after earning a save in clinching Game 5 was icing on the cake. The front office stayed busy during the season, too. The Tigers pulled off an eight-player deal -- a rarity in the 10-team KBO -- with the SK Wyverns on April 7 that brought in outfielder Lee Myung-ki and catcher Kim Min-sik. Lee, 29, stepped into the leadoff role in the Tigers' lethal lineup, and finished the season with a .332 batting average and 63 RBIs, both new career highs. He continued to be the sparkplug in the Korean Series, where he batted .364 (8-for-22) with three runs scored and two doubles. Kim was a steady presence behind the plate for the pitching staff in this series.